One of the items that have latest the longest in my closet in regards to quality and style is my North Face vest. I still have the one I wore back in college so many years ago! It’s funny to think that this is one of my most worn items ever. It is classic, layers over all different kinds of styles and is so cute! I wear it to and from the gym or layered or a thermal or long sleeve tee and leggings. The vest keeps me so warm and always so cute! The style is classic and the fit is great. My husband wears his so much too! Favorite water bottle! My goal every day is to drink 100oz a day. I love that Nordstrom carries a full selection of North Face outerwear. I not only found one for myself, I grabbed one for Michael and found Greyson a cute north face fleece to keep him warm and cozy this winter. Sharing my favorite North Face for the entire family below! Great look! I’m a huge fan of NorthFace and their jackets. I love the simple classic looks of their stuff and how durable it is. Oh this is just the perfect gym to street look! Loving the beanie! I am in love with this look and with your leggings. I am in need of some new leggings, I’ve been wearing too much black (boring) lately to the gym. This is the perfect gym look! Love that it’s neutral yet super-stylish. My favorite combo. Nordstrom is the best! Absolutely love this look! 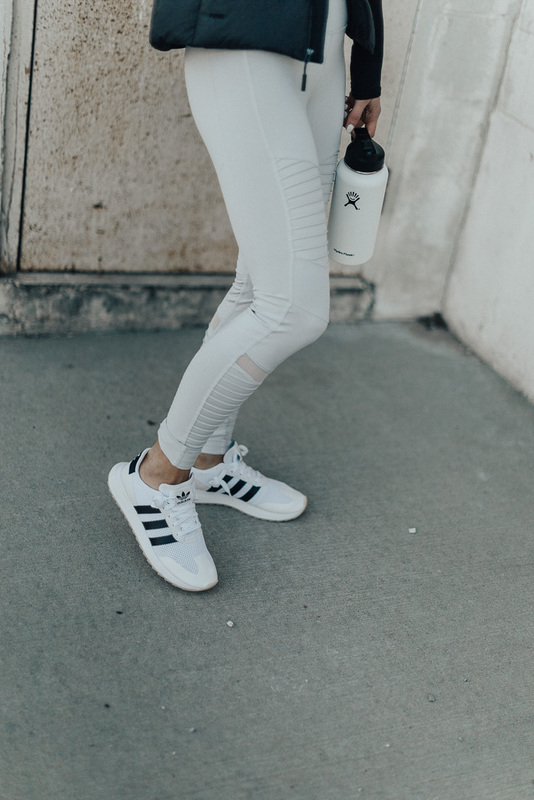 A perfect pairing that makes athleisure look so chic! And those shoes… I need! !